Friday July 6th 1883 I felt some better today and did some sewing for myself. 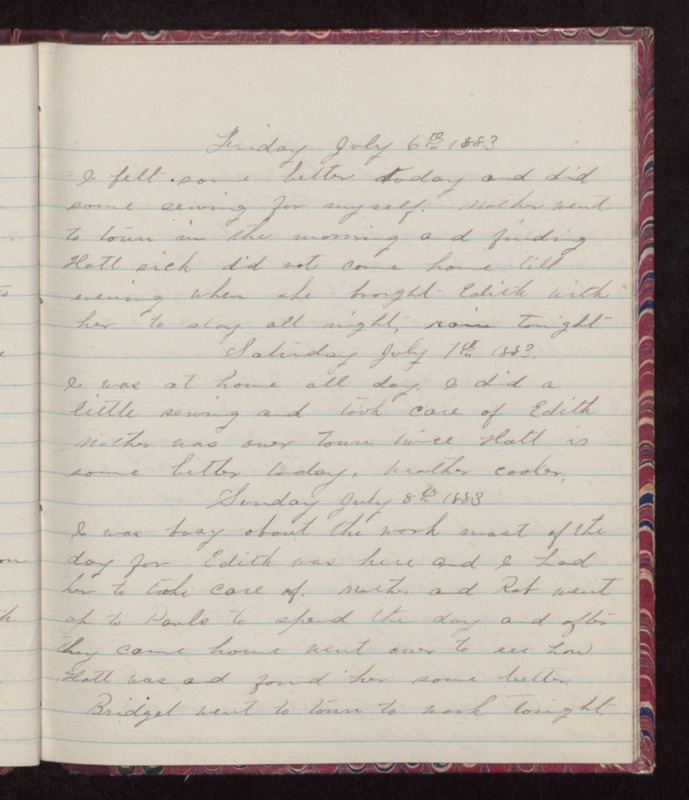 Mother went to town in the morning and finding Hatt sick did not come home till evening when she brought Edith with her to stay all night, rain tonight Saturday July 7th 1883 I was at home all day. I did a little sewing and took care of Edith Mother was over town twice Hatt is some better today. Weather cooler. Sunday July 8th 1883 I was busy about the work most of the day for Edith was here and I had her to take care of. Mother and Rob went up to Pauls to spend the day and after they came home went over to see how Hatt was and found her some better. Bridget went to town to work tonight.